This profile is part of our Mindful Parents mini series in collaboration with HERE For You, For Them, designed to both inspire you and pass on some awesomely easy mindfulness life hacks. You can also meet the founders Jen and Dana here. Zarouhi, also known as @yogawithzaz, is one of our favourite London yoga mums. 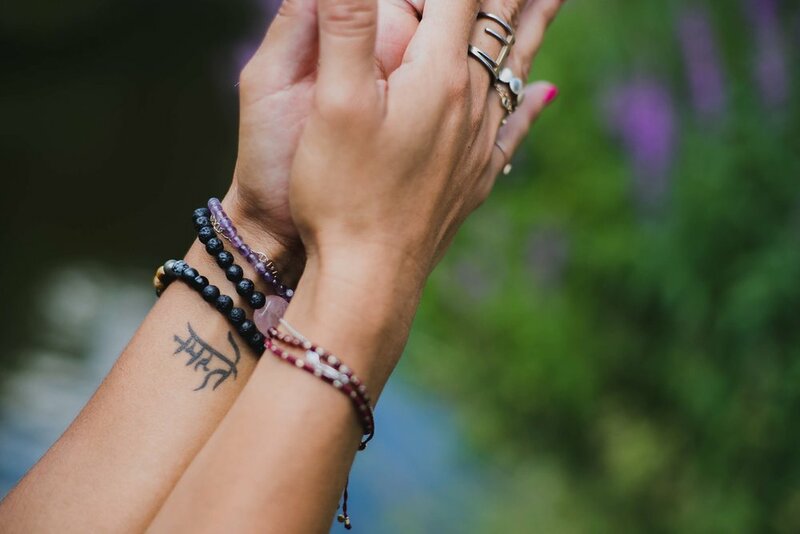 With a blog touching on topics like making space for ‘you’ in your life and the depth and nuances of yoga itself, we are so pleased to be featuring her! Zaz lives and teaches in London and was originally drawn to the yoga mat following a motorcycle accident in her 20s, when she quickly realised she could benefit from yoga not only in a physical sense but also on an emotional level by bringing some balance into her life. With over 20 years of practice behind her now, and her roles of mum and yoga teacher, Zaz is a true inspiration to all yogis who, alongside enjoy practicing yoga for creating stillness in the mind, thrive from a stronger asana practice. We at HERE wanted to ask Zaz a few questions relating to her role as not only a Yogi, but also as a mother. Her Q and A below reveals some interesting insight into her mindful approach to parenting, and also includes some workable tips to take-away for you to use in your own daily life and routine at home which we have summarised into Zaz’s Mindful Parenting Tool box. FOLLLOW ZAZ’S INSTAGRAM STORY HERE. To me, yoga is an interesting, subtle practice, which creates changes on a deeper level than the physical in a surreptitious way. It’s quite sneaky! My yoga practice has kept me sane during the stressful moments of parenting – most of the time – and I am very aware and tune in to how my children feel in the moment, because this is what we find in mindfulness and in yoga; it is the present moment that matters, not the past, or future. If they are upset about something, it may seem very small, but to them, in that moment it is huge, and as a parent I have to not diminish that experience, but to listen and help them find context and perspective, and the awareness that what they are experiencing will pass — and teach them techniques to deal with those things. Similarly, when there are stressful moments (the resistance to bedtime, a little person preventing us from sleeping, the frantic school run), while like everyone else I may initially feel frustrations, I always come back to the awareness that these times are brief, and will soon be over. Compared to 20 years ago when I was fully in the grip of an eating disorder, my mental state is vastly different. Because of my physical practice I feel stronger and more in my body in my mid-40s than ever before, and I am in a much calmer place of self-love inside. When I do have the odd wobble – perhaps on my way to a studio audition, questioning myself or having a difficult conversation, I come back to the mantra “I am enough.” I inhale “I AM” and exhale “ENOUGH” repeatedly and let it sink into myself. I also remind myself that there is always another day, that I can release negativity and work in solutions to problems rather than dwelling on what I haven’t done. My husband is also an amazing cheerleader and supporter of me as a teacher and mother, and reminds me of what I have accomplished and am working on. Most definitely! Taking time to sit down somewhere (it can even just be closing the door of the loo) to take 5 long, deep inhales and exhales is a great way to instantly create a feeling of calm. 5 breaths takes about 15 seconds (we can all find 15 seconds, even busy mums! ), and neurologically, 15 seconds is the approximate amount of time it takes for the brain to send a message to the endocrine system to inhibit the release of stress hormones such as Adrenalin and cortisol. It doesn’t remove those hormones instantly from your bloodstream, but it does give a little space and clarity for you to regain control if things are feeling overwhelming. I also like to do a forward fold to allow the blood to rush to the head, release the hamstrings and lower back. Sitting in malasana/yogis’ squat is also a great way to release hips and focus on lifting the heart. If you have a bit more time and space, a quick few sun salutations can’t be beaten for getting the blood flowing, and working many different muscle groups when done correctly, and can be modified. When the kids are throwing the occasional wobble and I know talking is pointless, I use ujayi breath to calm myself… or, according to where we are, I’ll do a headstand. I find it relaxing and it usually totally distracts the kids and they want to join in! I would love to say that my children join me for yoga poses or practice meditation, but usually when they find me on the mat they want to use me as a climbing frame or do acro yoga, which is always fun. Both my children have been able to do kakasana/crow pose and tittibhasana/firefly since they were 4, and headstands and handstands are commonplace at home. My son has also begun to learn the effects that breath control can have when he is upset or frustrated. We do alternate nostril breathing and focus on the inhale and exhale and it’s amazing how swiftly it helps to calm down. I’m so hopeful that that will be a tool he has with him forever. Be aware of your child’s emotions in the present moment, don’t diminish their feelings. If they are upset in one moment, no matter how small it may seem to you, to them it is huge. In moments of stress that could push you one way or the other, use the mantra “I am enough”- Inhale “I AM” and exhale “ENOUGH” repeatedly, and let it sink in. Take time to sit down somewhere (it can even just be closing the door of the loo) and take 5 long, deep inhales and exhales- a great way to instantly create a feeling of calm. Alternate nostril breathing and focus on the inhale and exhale- an amazing breathing method to help calm yourself and your child. To read more about Zaz and where to find her classes click here. Have you upped your mindful game? We would ❤ to hear from you. Contact us, comment below, or tag #WokeMamas.